If your marketing plan is spread across a dozen spreadsheet and word processing docs, or scrawled in a notebook... If your business plan is a slide deck and a months-old Word essay, or still just in your head... If you are planning a two-day conference with a mix of to-do lists, spreadsheets, and sticky notes... If your project plan is weighed down by tiresome project management systems...you could use a wicked-awesome new plan. Wicked Plan captures your entire plan in one place. Every part of the plan – your ideas, strategies, schedules, budgets, lists, deadlines, decisions – takes on the format you want for it. 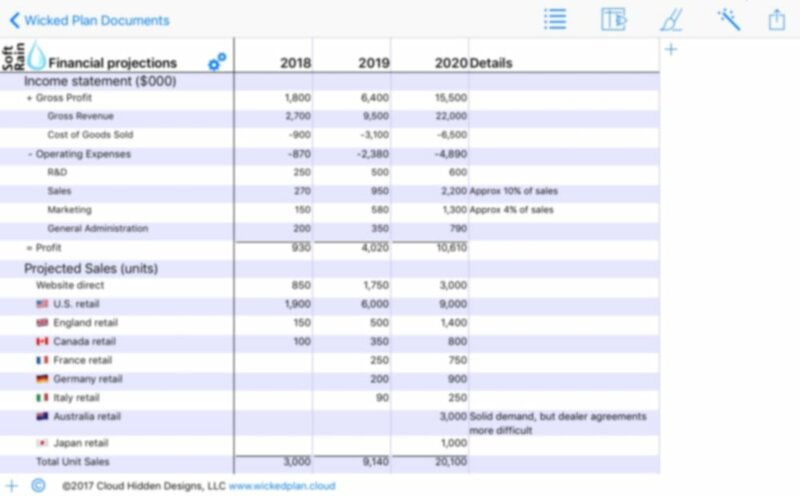 If your plan needs outlines and tables, you're covered. If your plan includes lists and timelines, they are there for you. If you want a live dashboard for your plan, it will be aggregated for you automatically. 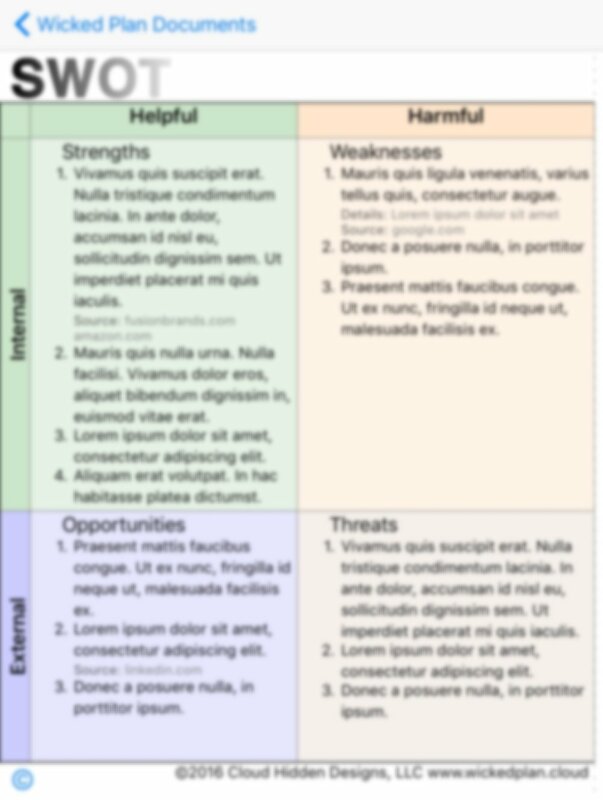 If your plan relies on powerful analytical tools like SWOT, PEST, or Eisenhower Matrix, not only are they in there, but you can customize them to suit your organization's needs. Or make your own new wicked tools and promote them to your clients. If you follow Lean Management, Agile, Business Model Canvas™ or other popular planning methods, Wicked Plan lets you mix and match all of these elements into a plan that's wickedly perfect for you. And with the Wizard* tool, it will even build the elements for you – how wicked is that?! For a quick start or convenience, pick & choose from dozens of pre-built components to build your own plan automatically. It's like Build-a-Bear™ or ordering a Chipotle burrito, but for your plans. 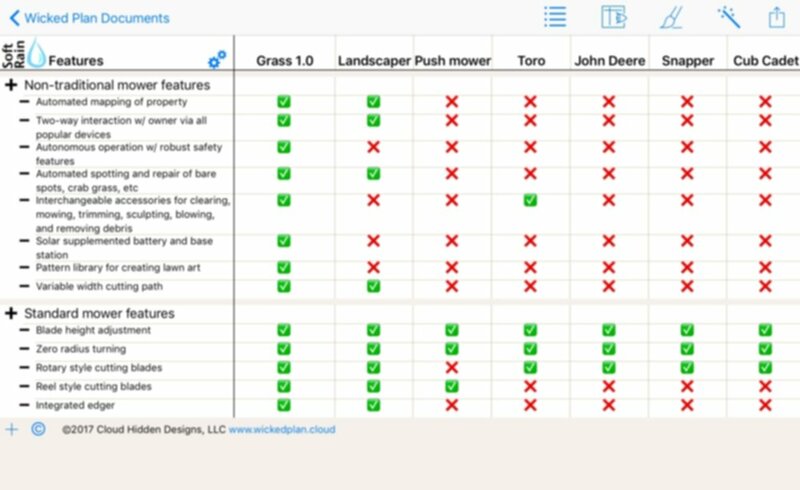 For a project plan, for example, you might pick a project status chart, an AIM chart for current issues, an Eisenhower Matrix for prioritizing, and a budget table. Get started in seconds. Or you can build from scratch with your own methods. Your plan. Your way. One place. Lists of lists, outlines, brainstorming, etc.